This friday, Mars will reach opposition. The Red Planet will roughly align with the Earth and the sun in the sky. You can watch the incredible astronomical event live or online. Mars will be at its closest and brightest to Earth in 15 years over the next few days, and you can share in the excitement by watching online or at local star-viewing parties. The Red Planet will reach perihelic opposition tomorrow (July 27) at 1:07 a.m. EDT (0507 GMT). According to Sky & Telescope, Mars will be directly opposite from the sun as seen from Earth, and will be at its brightest. It also will be visible in the sky all night, from sunset to sunrise. But if it's rainy in your neighborhood or you can't get to a dark spot, you can always catch the Mars opposition online. Viewers can tune in to a short webcast on Slooh today ( July 26) at 10 p.m. EDT (0200 GMT) to gaze at Mars and hear from Paige Godfrey, a physicist who performs public outreach and who also has studied exoplanets and brown dwarfs (failed stars). The webcast is available on Slooh's website for members, and will also stream here on Space.com, courtesy of Slooh. "For the past few weeks, Mars has been brighter than Jupiter, which is normally the second-brightest planet in the night sky after Venus. 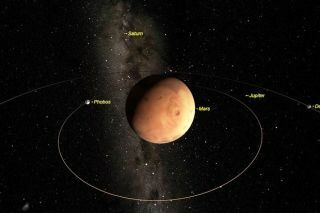 Mars is about two times brighter than Jupiter this month, and will remain so until early September," Slooh representatives said in a statement. The Griffith Observatory just outside Los Angeles will also host a livestream of Mars' closest approach on its website, in conjunction with an event on-site. The webcast will run from Tuesday (July 31) from 1 a.m. EDT (10 p.m. on July 30 PDT or 0500 on July 30 GMT) until 4:30 a.m. EDT (Tuesday 2 a.m. PDT or 1000 GMT). There are also plenty of viewing parties across the globe at local planetariums or science museums, so be sure to check your community calendar to see if there is one in your community. Here is a sampling, with all times listed below in the event's local time; the views of Mars, of course, are weather permitting. As mentioned, Griffith will have a public viewing party from 10 p.m. PDT Monday (July 30) to 2 a.m. PDT Tuesday (July 31). The grounds will be open, but the building will be closed; telescopes will be on the lawn for free public viewing. There will also be food carts. Residents near Sarasota, Florida, can go to a Mars viewing party at Robinson Preserve, 10299 Ninth Ave. NW., Bradenton, on Friday (July 27) from 10 p.m. to midnight. The event is hosted by the Manatee County Parks and Natural Resources Department, and will feature telescopes near the Mosaic Center for Nature, Exploration and Technology. The Hallstrom Planetarium in Fort Pierce, Florida, has several nights of Mars viewing between July 23 and July 31, with telescopes available from 8 p.m. to 10 p.m. The State University of New York at Oswego plans a public Mars viewing party from 11 p.m. to 2 a.m. nightly between July 24 and July 31, at Rice Creek Field Station. You can also look at Jupiter and Saturn through the provided telescopes. Editor's note: If you snap an amazing photo of Mars and would like to share it with Space.com Space.com for a story or photo gallery, send comments and images to spacephotos@space.com.